Washington DC (June 3, 2013) – Today, after a four-year process, the National Marine Fisheries Service (NMFS) published final fishing regulations for the Marianas Trench, Pacific Remote Islands, and Rose Atoll Marine National Monuments, which were established by President George W. Bush just before he left office in January 2009. Consistent with President Bush’s proclamations, the regulations prohibit commercial fishing within the monuments, but allow recreational and non-commercial fishing under certain guidelines. The rule takes effect on July 3, 2013. The Pacific marine national monuments span approximately 195,000 square miles of ocean and small coral islands, which provide prime habitat for a diverse array of marine and terrestrial species, including whales, valuable fisheries, and millions of seabirds. Many of the islands within the monuments, such as Rose Atoll in American Samoa and Palmyra Atoll, are units of the National Wildlife Refuge System, which is managed by the US Fish and Wildlife Service. The Marine Conservation Institute actively supported the designation of several Pacific marine national monuments, and has been working for four years to have them formally protected from illegal fishing, vessel groundings, and trespass. In February 2012, the Marine Conservation Institute filed a petition for rulemaking to the Secretary of Commerce and the Secretary of the Interior. 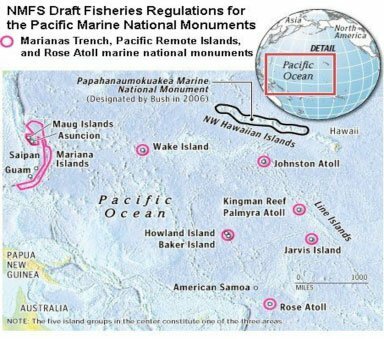 The petition requested that NMFS and the US Fish and Wildlife Service promptly issue regulations prohibiting commercial fishing within the Pacific marine national monuments. The petition was never answered, but today’s rule makes the petition moot. “In addition to the fishing regulations,” said Chandler, “NOAA needs to move quickly to plot monument boundaries on US nautical charts and describe these areas in official navigation guides and other relevant publications. This is the best way to notify and educate mariners that the monuments are legally protected,” continued Chandler. “These simple acts by NOAA will go a long way towards preventing illegal activities and groundings in the monuments.” Chandler noted that the boundaries of US protected areas are customarily delineated on NOAA charts to alert mariners when they are inside legally protected marine areas. Marine Conservation Institute is a nonprofit organization is a nonprofit, science-based organization dedicated to saving wild ocean places, for us and future generations. See www.marine-conservation.org. Great ruling to protect those National monuments in the Pacific Ocean. Good to see folks protecting our oceans and natural resources. I’m all for cleaning up our waterways and protecting our natural resources.